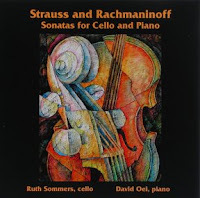 The June draw for the free CD featuring one of my musical artworks, "Fractured Cello", now has a winner. People who sign up for email updates to my blog are eligible for the draw which will take place each month. In my next post I will let you know what the draw will be for July. After finishing my last painting, "Tempo in Blue", my studio looked really messy so today I spent time getting it cleaned up. I thought it would be fun to do a video of the studio to post on the blog but first I have to learn how to do it. I actually know how to take the video but I have to work out how to edit it and then post it. With all this new technology there is always so much to learn. 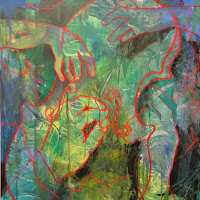 Some paintings come together easily, others have to be dragged into being and this is one of them. The early stages went well but then it all changed and it got darker and darker. 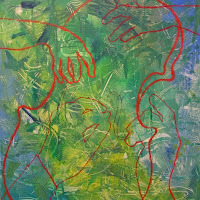 A lot of my recent work has been very red so at least a blue painting is a nice change. I like the idea of "Tempo in Blue" but I'm not sure how happy I am with the final result. I am taking a break to look at it a lot and decide what, if anything, I need to do to finish it. The top picture is where it is at the moment but if you scan down I have included photos of many the stages it went through. 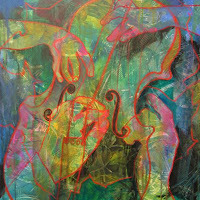 First of all I put in a random background wash.
Next the image of the cello and hands were added in red oil pastel. This will resist the acrylic paint and enable me to scratch back to it if I want. I start painting in and around the image and pattern of the wash. This is where the fun starts. After this it went very dark and I forgot to take a photo. Since then I have lightened it up and the photo at the top is where it's at now. 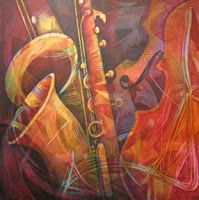 I feel this Saxophone painting is finished. It's rather busy with all the patterned underpainting showing through but I think it makes it more interesting, in fact, I have enhanced the pattern in many places by backpainting around and into it. You can see pictures of the process, right from the start, in previous posts. 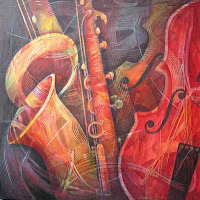 If you like musical paintings check out my web site http://www.susanneclark.com/ and go to the musical page where you will find lots of cello and saxophone paintings with a few pianos thrown in. If you are interested in receiving updates to my blog drop down and read my previous post and read how you can be in a draw each month for free goodies by just subscribing. Hopefully I will have some fun items for you. Wouldn't you like something for free? Sign up now to my mailing list and be in for a draw each month to receive a free gift. This month it's for a copy of the CD "Strauss and Rachmaninoff - Sonatas for Cello and Piano" with Ruth Sommers, cellist, and David Oei, pianist, and featuring one of my paintings as the CD's artwork. 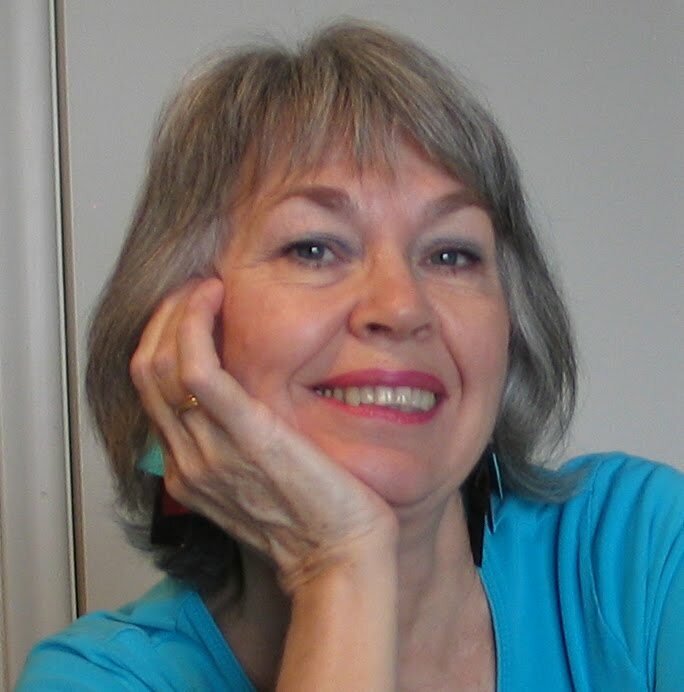 Ruth is the director of Festival Chamber Music in NY. It's a great way to keep up with my new work and get an insight into the daily work in the studio. You will be in for the draw each month you are on the mailing list. 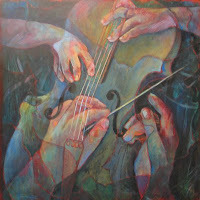 Gifts over the coming months will be CD's, collagraph prints or a reproduction of one of my musical paintings. As they say, you have to be in to win. My daughter knows all about this principle. She enters lots of things and has won some great prizes over the years. One was dinner and a baseball match at the Sky Dome in Toronto for 12 people plus team merchandise. I can't match that however! Subscribe in the box to the right of this. You can have your name removed at any time by emailing me and I certainly won't give your email address to anyone else. 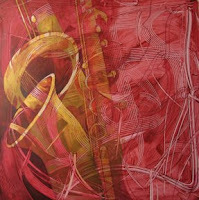 I will be posting a picture of the finished Golden Sax painting in a day or so. You can see pictures of the first few days work in a previous post. 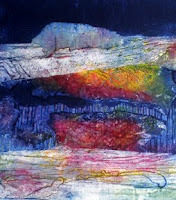 I just found out yesterday that one of my recent collagraph prints, Mystery Mountain, won second place in the Atlanta Artists Center current exhibition. 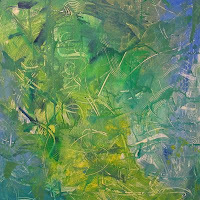 The exhibition called "Saturation" runs through to the end of the month. I was quite amazed when I got the call to say that Mystery Mountain had been selected because when I dropped off my three pieces for submission to the show there appeared to be a huge number of entries. I was therefore very pleased to get all three accepted and win an award. A nice surprise. The Golden Saxophone is turning out to be a very glowing picture. 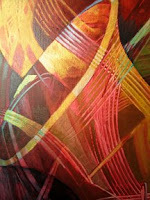 I have used bronze, gold and silver paint on the sax and with the overpainting of other colors it has lots of metalic glints. It's rather busy with all the textured pattern showing through but I quite like the effect. Tell me what you think. I should be finished in a day or so so check back to see the finished result in the next update. I started a new painting this week. It's another in my ongoing musical series. What always amazes me is how a painting can take on a mind of it's own. I decided on the composition and then started to put a wash on the white canvas, as I usually do, to get it started. I textured the wash and then that's when it began to happen. The pattern of the textured background started asking to be enhanced and the saxophone demanded to be painted in gold paint! I wanted this painting to be quite abstract with the subject matter blending into the background but with all the pattern I feel it's going to be a bit overwhelming. I have added a couple of pictures showing the process so far. 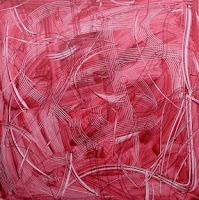 This is the canvas with the textured wash and the basic outline of the composition drawn on it. You will have to look hard to see the drawing of the sax and cellos. Here you can see where I have started to add the gold and bronze paint and begun back painting into the texture in red, in the background on the left hand side. This shows the pattern and detail. I will simplify it all as I go along. Check back over the next few days to see the progress.